March 23, 2010 / David H.
It's nothing unusual to think about what's next after a big race, especially one as satisfying as this one. But I already know what's next -- the Richmond Marathon. At least that's what I signed up for four months ago. After setting a PR in a half marathon, I'm still on Cloud 9 with my speed at a long distance. While I'm celebrating my success, there's part of me that knows I can go faster. I know that getting in the 1:30s is very much reality -- shaving just three minutes off my time puts me at 1:39. Is it worth it training for a marathon? In 2007 when I had some of my best running going on, I was training for the marathon ... after that though, I was filled with a whole lot of disappointment. For now, I'm not making any decisions. I just know that right now I can capitalize on what three great months of training has already done for me. Waiting until November for the next "big" event just seems weird. Community races in between will be nice and I have some times I'd love to beat ... but I love the half marathon. * I am the owner of a Power Balance wristband. Take a look at the website for yourself. In looking up things on the Internet, some say it's a scam. I say it works. If it's just a mental thing, so be it. * I bought a new pair of Brooks Ravenna even though I don't need them for a while. They were 20 percent off and I saved about $5 from what I paid for online earlier this winter. The nice thing is I'm set for shoes until mid-summer probably. I hope longer -- these shoes tend to have a good life on them more than other shoes have worked for me. I've stayed injury free since I switched to these, so no reason to change. Speaking of being injury free, a little more than a year ago I went to the doctor about my lingering foot problems that started at the end of 2007 (after the, um, marathon). After wearing a special insole for a couple of months and then switching to nothing at all, my feet haven't bothered me much. I'm not putting anything else into my shoes again. I didn't have any problems for a long time, and then for some reason I put gel insoles in. While it was initially comfortable, they haven't really "worked." And by "worked," I'm not really sure what good they do anyway. It's a personal thing, I think. * The Shamrock event expo is great. 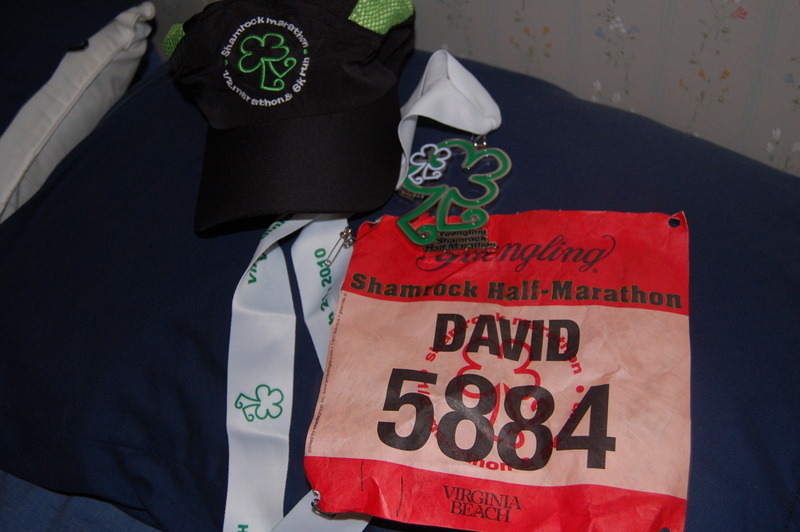 After some issues with it in my first Shamrock in 2007, they've made drastic changes to the layout of the floor plans and picking up the race number and T-shirt. It's been mostly flawless ever since. The Virginia Beach Convention Center in general is just a good place for a race expo -- even as much as I've complained about the Rock 'n' Roll Half event, the expo is always great there. All four of the Shamrocks are in the 1:40s. It's kind of weird to think that I beat last year's time by almost 7 minutes. It's also very satisfying to know that I've done eight half marathons since 2006. * Lastly I wanted to give a big thanks to the Shamrock organizers, the hundreds of volunteers, the sponsors and all the people who lined the course this weekend. This is always a special event no matter what the time was on the course and each year it seems to get better.